Do you teach group dynamics in your classroom? Or do you just assume that students will figure it out? In my experience as a teacher, group dynamics is not an integral part of most curriculums. The process of learning how to learn together is rarely if ever discussed in faculty meetings, professional development seminars, or department meetings. And yet, what is more important for our students? When we say "get into groups..." or "in this discussion, try to...", we are assuming that they understand how to share a space, value everyone's voice, and build a conversation or group process that will actually work for everyone. Very few people really know how to do those things. Think about your faculty. Is there a discussion dominator in your department? And someone who tends to be silent? Are there freeloaders and hyper-organized do-it-all-ers at every meeting? Does everyone sigh when so-and-so asks yet another question, and everyone wonder if that one teacher is even paying attention or just checking Facebook on her phone? Over the years I have learned to talk to my students about what it means to be a good group member and discussion participant. I have learned to ask them how group work is going and how they feel we could improve as members of the discussion. I have learned to offer them choice between group and individual work, so they do not always have to face a frustrating situation when they find group work really challenging. Group work is not the easy option for most students (and teachers!). The thought of team teaching a class has always made me feel a little ill, though after years of learning from and with my students about what makes for good group dynamics, I might just be able to do it now. Before launching in to literature circles, fishbowl discussions, Harkness, the socratic method, or any other discussion or small group pedagogy, it really helps to teach students how to share the space. You can make a big impact on your students' lives, by helping them how to best work collaboratively together. It won't look the same in every classroom, or even every group. But you can help students discover what works for them, and what some of the universal guiding principals are. 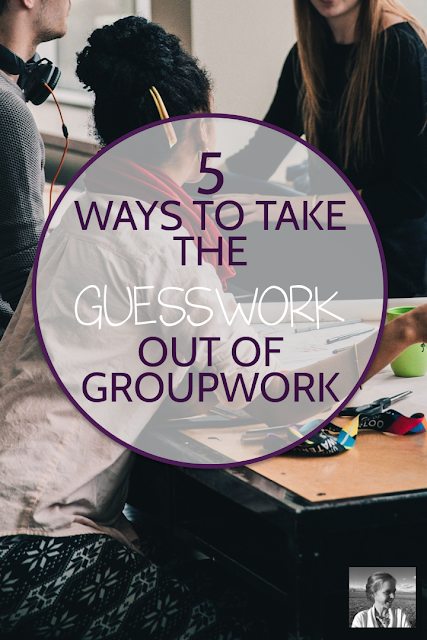 Here are five ways to take the guesswork out of group work (scroll down for a free curriculum set to help you make this easy!). Take a little time to have students talk to each other about their past experiences. How have their groups shared the work? Has everyone participated? Was everyone's voice heard? Let them interview a few partners to hear about their past experiences. It's anchor chart time. Put up one of those fabulous giant sheets of paper and let your students tell you what makes group work work. What does each participant need to do? What do they need to avoid? What makes it fair? What can the teacher do to help? Make a list, and POST it in your classroom. Draw their attention back to it before group activities and projects. Give students a chance to reflect in writing after group projects, and set a goal for the next project. How did they positively contribute to the group? What went well and what didn't? What could they work on for next time? Whole class discussions also rely heavily on positive group dynamics. I always like to spend one of the first days of class talking about what goes into good discussions. Students are great about brainstorming ideas, and I ask one student to write all the ideas down. There's always one thing I bring up, with every class. First I turn toward just one student, and stare into his or her eyes. Then I talk for a while, intensely, just toward him. "How does this feel right now? Is this a good way for me to focus during discussion? Does everyone in the room feel like they're part of things?" Usually the student I'm staring at admits to feeling totally weird and uncomfortable, and everyone else says it's weird and they feel left out. Then I talk about how EVERYONE is an equally important part of our round table discussions, and that students need to try hard to make eye contact around the room and not just focus on me as the teacher, as if I'm the only one who matters. 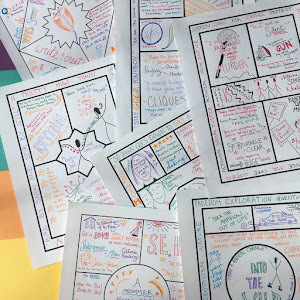 I use this brainstorming session to segue into the use of student-led Harkness discussions, which is one of the most positive ways to encourage good group dynamics that I've ever used. Find out more about Harkness here. Putting group work in context is really helpful. Have an honest conversation about the group contexts that are waiting for your students. Someday they will need to share their ideas with groups at work. Someday they will sit down around the dinner table, or the PTA table, or the boardroom table. Someday they may be working on a collaborative start-up team, or working virtually through videoconferencing with a team around the world. Someday they will very likely find a life partner who they will need to share ideas and brainstorm solutions to everyday problems with. Rarely does group work get put into this type of context. Could you use a little help with all this? I made you something! 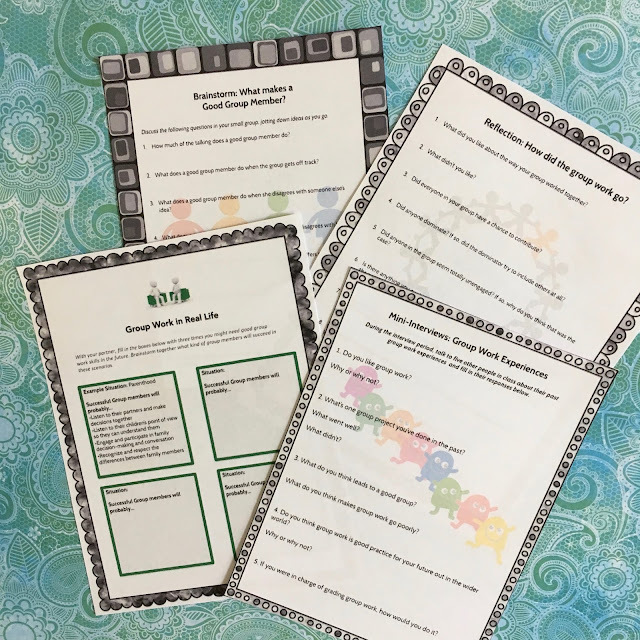 Grab the free curriculum packet that will help you guide your students through the complex waters of group work. Sign up below for my Friday e-mails full of creative teaching ideas and helpful resources and this packet will be the first thing I send you.